What do you remember about the last company event you attended? Were you more excited about the cheesy prizes or your coworkers’ endless speeches? Maybe it was the drive out to the middle of nowhere. A poorly-planned holiday party is a very expensive missed opportunity for an organization. These kind of ill-fated events can actually leave employees feeling underwhelmed at best and completely unappreciated at worst. In contrast, a well-planned and skillfully executed company event shows employees that they are valued. Effective holiday parties are fun, company-culture appropriate, convenient, and inclusive. These kind of events set the stage for the next few months, offer opportunities to appreciate employees, and also instill traditions for years to come. In this article I share the absolute most important considerations for your upcoming employee events. Employee buy-in is critical to the success of your event. You can throw a holiday party with all the bells and whistles but no feedback and seriously miss the mark. I have personally found that a planning committee consisting of employees at all levels from every department ensures proper representation and company-wide support. Ask employees what has worked well in the past, either at your company or at a previous company. Share the budget with them so that they have visibility into any limitations. If any suggestions cannot be incorporated, make sure everyone understands why. Karen from legal might have a different perspective on an open bar than Jim from Business Development. Compromises may need to be struck, but everyone can still come away feeling like they were heard. Collaborative planning ensures that your event includes as many desired elements as possible, and employees will feel invested in the process. Consider the timing and venue carefully. Holiday parties should be timed to be the most convenient for the staff. 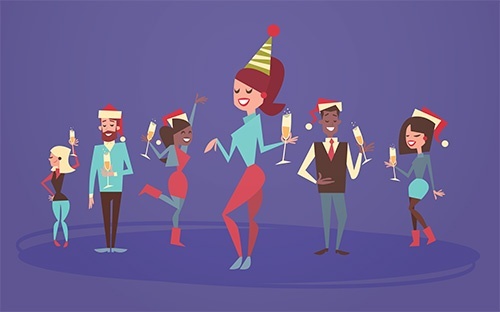 Kevin Kelly, the CEO and Co-Founder of Rhabit, says that they always schedule their holiday parties before the actual holidays so that the maximum number of people can attend. The venue should be someplace other than the office or warehouse where people perform work. Staff need to feel unplugged as well as excited about the chance to experience someplace new. Trendy event spots, nice restaurants, local establishments like breweries, iconic buildings, or historically significant structures are a few popular choices that tend to play well with most employees. It’s important to understand that perception is reality when it comes to how employees view your choice of venue. Be conscious of the fact that employees will equate the quality of the event setting to how much the company thinks they are worth. Selecting a nice venue also gives employees the chance to take their families somewhere special. Now, nice means different things to different people, so keep your population and culture in mind. Additionally, make sure the location is convenient for most staff. Leverage internal data to map out the areas where the majority of staff live or to which they might easily commute. Believe it or not, people actually do not want to hang out with only their coworkers outside of work. Why? Because it feels like more work. Employees have lives and families, and they want to include their families in what they do. This is especially true for employees over age 25, and the likelihood that employees will hang out with coworkers outside of work significantly decreases as employees get older. One study done by Comparably shows that 65% of employees between the ages of 18 and 25 hang out with their coworkers at least once a month, while only 31% of employees age 56 to 60 hang out with coworkers at least once a month. Allow staff to share their whole, real selves by opening up the event to family and/or friends. Cater to employees’ guests. If the event is held at a kid-friendly venue, there should be plenty of fun activities for the kiddos. This will increase the likelihood that employees will attend and have a good time. A 2017 Office Team survey found that two-thirds of employees would quit their jobs if they did not feel appreciated. When asked about the best forms of recognition they had received, the responses primarily included tangible tokens of thanks and verbal or written praise. A company party can be a great venue for such awards and recognition. You might briefly thank each department and call out their contributions to the company’s overall success. If the company is small enough, company leaders might even be able to thank each individual and share specific details about their contributions. The trick is making sure everyone feels appreciated without leaving anyone out. Apart from the highly effective pat on the back, employees love the gift of... well... gifts! Great food, cash prizes, and freebies are well-received by staff. Provide awards that are functional, like engraved pens, embroidered shirts or caps, branded coffee mugs, or other creative employee reward ideas. Nothing says thank you like a gift you can actually use! I have also seen CEOs at several companies use this opportunity to announce surprise holiday bonuses. Holidays can be expensive and stressful enough without your employer pressuring you to buy gifts or make donations. As one study conducted by Greenberg Quilan Rosner Research found, most people in the US feel more stressed during the holiday times due to obligatory gift giving, financial constraints, and commercial pressure. Competitive games like white elephant gift exchanges make employees feel obligated to spend money. Instead, consider an optional Secret Santa-type gift exchange. Services like Elfster make anonymous gift giving possible for employees regardless of their geographic location. This allows more employees to participate, but only if that want to. Spending limits (minimum and maximum) are also recommended to avoid inequity or embarrassment. The company can also provide an indirect form of support to charities. Many employees are happy to donate their time to a cause they support. You can use the holiday event as an opportunity to connect employees with meaningful volunteering opportunities. Volunteering provides employees with a plethora of benefits including better health, professional growth, and greater socialization. A holiday party is your chance to show your employees that they are valued. 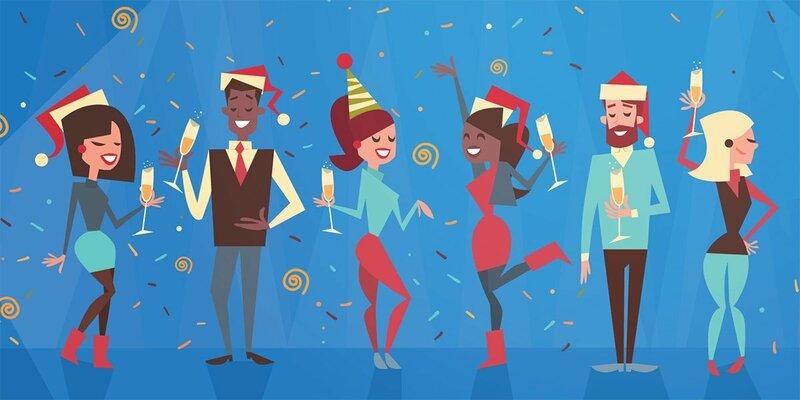 This year, you can pull off a highly successful holiday party by providing the venue, gifts, appreciation, togetherness and inclusion that your people crave. With a well-executed holiday party, you’ll remind your staff why they should stick with you for seasons to come. Business Owner. Author. Purveyor of HR Business Solutions. Compliance Consultant Extraordinaire. Mother, Wife and Schnoodle Enthusiast.